Being able to sit outside in comfort is a great way to relax. 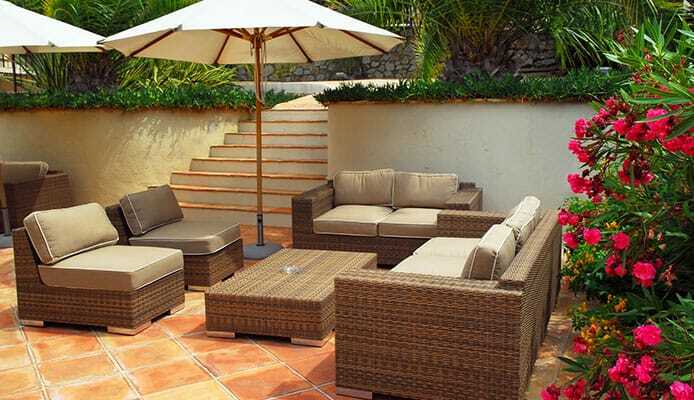 Getting the best outdoor furniture will not only allow you to do that but it will also improve the look of your patio but in order to withstand the outdoor environment, it has to have a high level of quality. In order to choose the best patio furniture there is plenty to consider. The style is always going to be important as you want your furniture to look good but the material, size and comfort are also vital, as is the amount of pieces in a set. Here we will look into those key features and have developed a buying guide to give you all the information you need. We have also completed outdoor furniture reviews to show you the best products out there on the market. 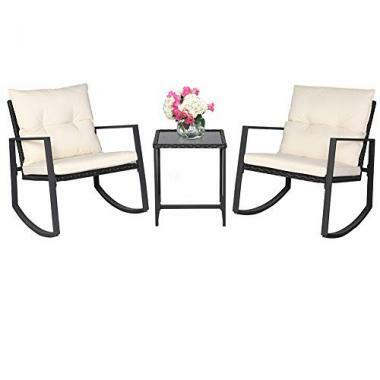 This top rated patio furniture from Keter is a simple set that is going to look perfect on your patio. It comes with two chairs and a table allowing you to relax outdoors and it comes in two colors of either whiskey brown or sparkle grey. It comes ready to assemble and the molded rattan design is going to be able to give you a high level of durability, as well as a high level of comfort too. The set is also rustproof to ensure it can cope with the outdoor conditions. 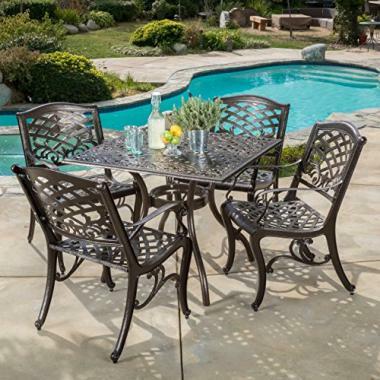 This patio set from Suncrown is another 3-piece set that has a high level of build quality. 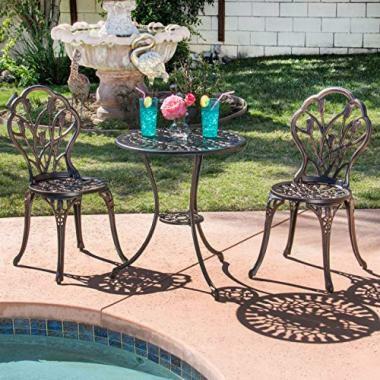 It also looks great too and comes with three different designs to be able to fit your patio. 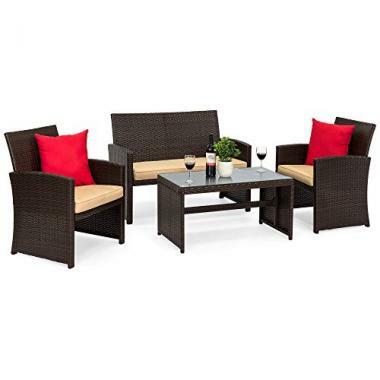 It has a stylish design and is one of the most attractive patio sets out there. The chairs are able to rock which only adds to the high level of comfort that they have. They have cushions that can be easily washed and the construction of the chair is highly durable. Assembly is also quick too, making this a great product. In terms of outdoor furniture, this is another high-quality product and one that has received a long list of great reviews from those who have used it for a long time. It has a durable steel frame that is going to ensure that it lasts for a long time. The sponge cushion is going to be able to give you a very high level of comfort and the rattan wicker chairs are going to look great on your patio. They are easy to assemble and are going to last for a long time and no maintenance is required. When buying patio furniture, it’s always important to know exactly how many pieces you want in a set and where they are going to fit. This has two chairs and a sofa that is going to be able to accommodate a lot more people than other products. The outside furniture is also one of the most stylish products on the market and it will look great wherever you place it and there are also three different color options. All the pieces are very easy to clean and therefore the maintenance is going to be very low. Suncrown have been able to produce more great furniture for patio with this product and another one that has a high level of style. 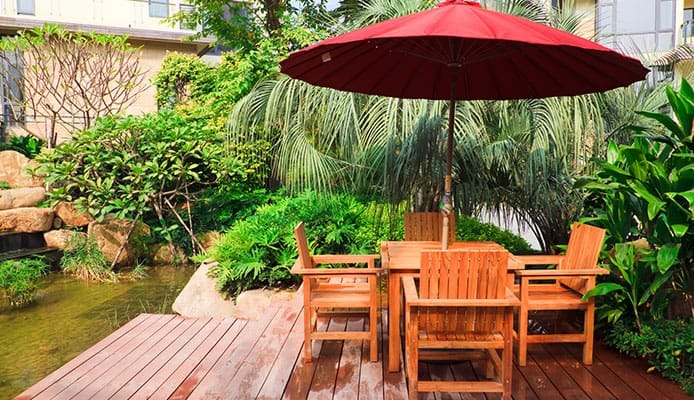 It comes with two chairs and a sofa to give you a lot of seating space when you are outside. It has an attractive glass top table and the products have a weather-resistant resin that will help to protect it when the bad weather sets in. Installation of the product will be very easy and this is a quality product that should last you for a long time. In terms of high-end outdoor furniture, this is going to fit right in with its quality design and build quality. 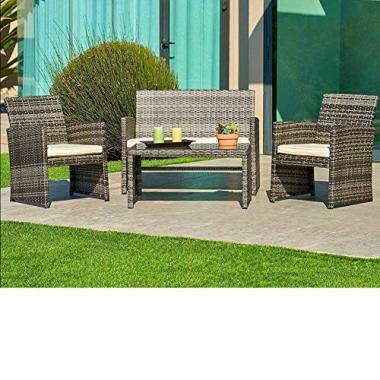 This is perfect for anyone looking for a larger seating area as the seven-piece set will give you the perfect outdoor seating area and is the most comfortable outdoor furniture you can buy. The cushions are available to buy in a great range of colors, allowing you to add your own personality to your patio. It is made from high-quality materials that are going to be both highly durable and also very easy to clean too. Goplus are one of the patio furniture brands you can trust and this is a high-quality product that has a frame that is made from strong powder-coated steel, which will not only give you a high amount of durability, but it will also be resistant to rust. The sponge padded seats are going to be able to give you a high level of comfort and the tempered glass will give you a durable and easy place to place your drinks. It is very easy to clean and the maintenance time with the products is going to be very low. If you wanted something different for your patio furniture then this would be a great choice. It has the look of a rustic antique that is made out of heavy wrought iron but instead they are made from much lighter aluminum. They are styled with a floral pattern and this set is perfect for anyone looking for something a bit more rustic. There are also a lot available in the table for you to be able to place a patio umbrella, which is a feature most products don’t have. 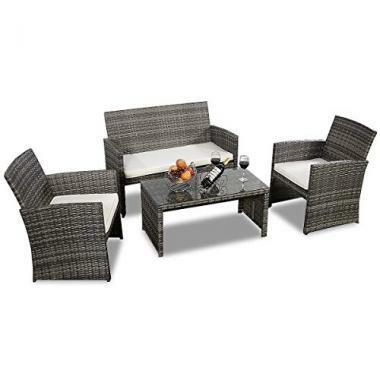 This patio furniture set from Great Deal Furniture is another product that is made of aluminum. There are a few different buying options available which are going to allow you to get the perfect set that matches your patio needs. The furniture is going to be able to give you a very high level of durability but also a very low maintenance level too, allowing you to leave them outside without the fear of them getting ruined. They come in a hammered bronze color that looks great. This patio dining set is different from other products on this list as it has a very stylish wooden design that is going to take more maintenance but a lot of people will see that as worth it for the very high amount of style that you get. You are able to have a vast range of buying options and will be able to pick between five different shapes as well as four different amounts of pieces. 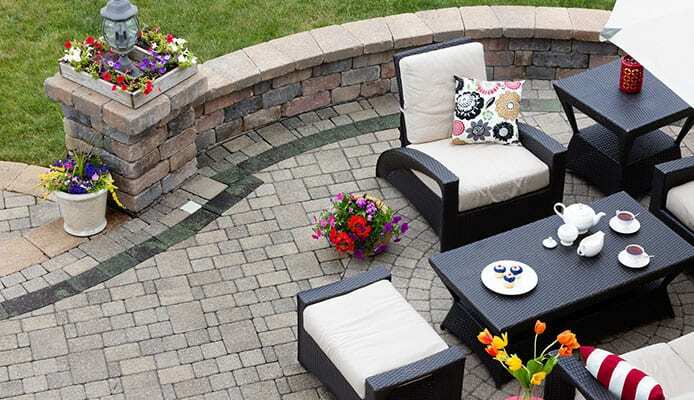 That allows you to find the perfect product for you to match the patio space you have. When it comes to patio furniture, the material is going to be vital in the choice that you are going to have to make. Materials have a different level of style and maintenance and all of that has to be taken into account when choosing the best patio furniture for you. Wicker is one of the most popular materials that you will hear of but in reality, it’s not actually a material at all. Wicker is just the style of the way it is weaved and you can have a lot of different materials in there. Most wicker is now made out of synthetic material that gives it a good level of style and also means that the maintenance costs are very low. It will have a waterproof finish so that no water can get to it and the surface will be able to be easily wiped down with a cloth. With these types of products you will want to check what type of frame that it has to ensure the durability of the wicker. Something like a lightweight steel frame would be the most ideal solution for this type of product. Aluminum is another material that you will often see with patio furniture. It is a material that has many qualities as it is lightweight and durable but also cheap too. These qualities make it ideal for a wide number of different applications. It can also be styled different ways and we have seen in this product list that we have sets that look antique and other ones that have a much more modern design. It is also highly weatherproof and can be left outdoors without worrying about any rust or deterioration. 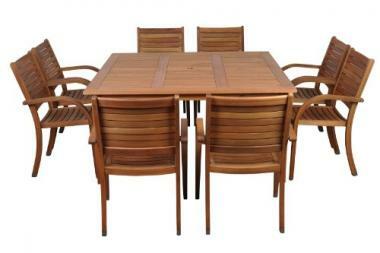 Wood is also another material that we see widely used in patio furniture. Many people will say that this is the most stylish material that you could possibly get for a patio furniture set but there are a few drawbacks with that. If kept outside, wooden furniture would need yearly maintenance to keep it looking good and you also have to worry about any rot from occurring. If maintained properly though, it can be a great material which will look great. Each material has its advantages and disadvantages and you need to work out which one is going to be the most ideal for you and your situation. The style will always be a huge factor with patio furniture, but you need to think about the overall build quality too. The size of your patio furniture is obviously going to be a big consideration when it comes to buying it. This is not only going to depend on your needs in terms of seating capacity but also the area that you will have. This furniture will need to be set down on solid ground and you need to take a look at the space that you have available so you will be able to plan ahead and decide which type of set is going to be the ideal for your individual circumstances. Not only is there a large variance in sizes but also shape too. It could be that you want a dining set but only have a narrow but long space to work with. In that case it probably would be the best idea to get an oval shape as this is going to accommodate the largest number of people. Getting the right size is important as you don’t want to end up having something that is too small and ends up having to come up with an alternative solution. Equally, you don’t want to have a furniture set that dominates an area and prevents people from getting past. This is where it would be a good idea to measure out the space that you have to work with so that mistakes don’t occur when it comes to setting it up. This also depends on whether or not you are looking for a dining set or a lounge set, which we will go through in the next section as both have different requirements. In terms of patio furniture, you need to ask yourself why you want it. Is it just so that you will be able to relax while you are outside in the sun or do you intend on having meals outside with the family when the weather permits it? These distinctions are important in regards to getting the right furniture. With dining sets, they will come with a table that is set at a comfortable eating height and enough chairs around it for that purpose. This will make it as easy as possible for you to easy outside but also a good height to do other types of garden activities too. These often take up more space than lounge sets due to the greater need for a larger table that is required to be able to enjoy it as an eating area. This could be seen as an advantage or a disadvantage depending on your needs and the area that you have available. That obviously doesn’t mean that you aren’t going to be able to relax with a dining set. The table provides a great place to put your drinks or you could simply pull the chairs away from the table and enjoy their comfort in a different area. Dining set table often come with a slot for a patio umbrella too for protection from the sun or rain. A lounge set on the other hand will be made with the sole purpose of trying to make you as comfortable as possible. They will often have a lower profile and a greater range of cushions to be able to give you a more relaxing area too. If there is a table in the kit, then this will often be much smaller and lower to the ground than with a dining set. That makes it unsuitable for eating from but to many people this is not going to be a concern as they can hold a plate or eat inside. There is also the option of getting a camping table to fold out when needed. Due to this lack of table size, a lounge set gives you more options of where you are going to be able to put it. This will be easier to move around and will sit into more places than a dining set would. There are lounge sets which are quite big though and do take up a lot of space. The right product for you will obviously come down to your needs and the area that you have. The ideal solution for many would be to get both a lounge and dining set but that’s not an option many people have due to space or budget. The number of pieces that you are going to need in your set will depend on a few key factors depending on the space that you have, how many people are going to need to be seated and also the style that you are looking for. When it comes to getting a patio furniture set, one of those pieces will almost always be a table. As we have seen from the previous section, this can either be a small table on which to place your drinks or it could be a much bigger table that you are going to be able to dine on. Aside from this table you need to decide how many seats that you want and how many people you intend to sit. 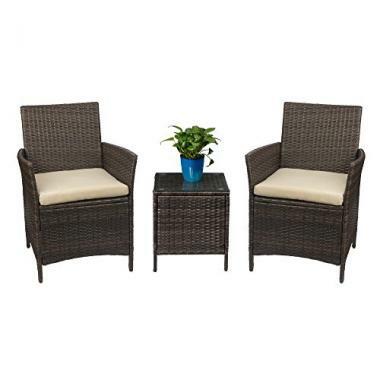 A lot of these sets simply come with a small table and two chairs to allow you to relax on your patio whenever you want. Others will come with more chairs if required but there also other sets that come with a long sofa, which will be able to give you an extra level of comfort and can be a great option if you have children as it will be able to fit a lot of people on. There are also other sets that come in a wide range of different pieces for the ultimate relaxation experience. This will allow you to lie down or relax in a way that you could if you were sat on a chair. This also gives you more customization if you are working in a unique space. If you’re unsure about how many pieces that you need and have enough space, then it might be the better option to go for a product that has a bit more sitting available to ensure that you always have enough seating for everyone. In the list of requirements for patio furniture, comfort is going to be high on the list of priorities. You always want a chair to be comfortable whether it is in your office, in your home or situated on your patio in the summer. All the products that we have looked at here are well-designed and are going to be able to give you a good level of comfort. They are well designed to be able to support your back and allow you to relax and enjoy being out on your patio. Sometimes there are other factors take into account too, such as whether or not they are going to come into contact with water or not. If you want to cool down after getting out of your hot tub, for example then you wouldn’t want to have something that is going to be affected by the wet. Once you’ve checked the temperature with your outdoor thermometer, you’ll be able to head outside and enjoy your patio in comfort. If it does start to get a bit too cold, then getting an infrared heater would be a great way to stay comfortable. The first question you need to ask yourself is whether or not you want cushions. On the surface this seems likes a question with an obvious answer but it’s not going to be that simple, as cushions do require a higher level of care maintenance which you may wish to avoid. This is because they are liable to hold moisture and therefore would need to be put away as soon as there is a chance of rain. They also are harder to clean than any hard surface which is another aspect to take into account. This is not going to be a huge issue though and if you want cushions, you then need to decide what level of cushioning that you want. Some of these products just come with a cushion on the base of the chair whereas others will have a cover on the back too. This depends on how you sit and your own personal preference. This also depends on the situation that you’re in too. If you are wanting some furniture for next to your above ground pool, for example, then cushions might not be the best idea as they will frequently get wet. In this situation, a boat deck chair might be a better option or a beach chair would be a great idea. If you don’t want cushions then there are plenty of other options out there that you can look into. It’s important to be comfortable but sometimes you might prefer the convenience of not having to put away and bring out your cushions all of the time. Q: What Is The Best Material For Outdoor Furniture? A: There is no one material that ranks above all the others as each material has its advantages and disadvantages. Wood, for example, would be a lot of people’s preference in terms of the way it looks but is had more disadvantages than other options. It doesn’t have the durability of a wicker set or an aluminum one. Aluminum is light, durable and cheap, but people might not like the look or the comfort levels that you are going to be able to get from it and therefore people might look at different options. Wicker resin can be a lot of people’s preference as it will give you a natural level of cushioning and it’s also going to be very durable too. Some people don’t like the feel of it though and would prefer something else. As you can see, there isn’t one clear winner. What you need to do is balance al the key aspects such as style, maintenance and durability and then you will be able to see what is going to be the most important to you and then you will know what is the best option for you. Q: Should I Leave My Patio Furniture Out During The Winter Or Not? A: The best advice would be to store away all of your outdoor furniture when you are not using it but this is a hassle and not everyone has got the time, patience and space to repeatedly get their furniture in and out all the time. If you are not going to be using it at all over the winter, then it would be the best idea to store it away as this will increase the lifespan of the product. Aluminum and wicket resin though are a lot more durable and are unlikely to be affected. If you have wooden furniture then this is much more prone to the effects of weather, especially if the temperature is going to dip below freezing. It goes without saying that any cushions should be stored away. 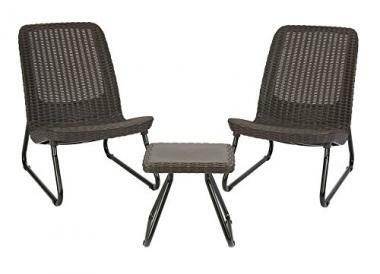 Q: How Durable Is Plastic Patio Furniture Set? A: There is always difficulty when answering a question of plastic, as it comes in so many different forms and strengths. A resin wicker chair, for example, is technically plastic but this will have a steel frame and therefore be highly durable. Cheap purely plastic chairs are never going to have the highest amount of durability though. We don’t feature any of those types of products in this list as they will break easily. All the products here are highly durable and should last for many years. Getting high-quality patio furniture can really have a large effect on how your outdoor space looks. It can take a bare area and make it look a lot more comfortable and inviting than it was before. It will give you space where you will always be able to relax and socialize. As we have seen here, there is a lot to consider before you would be able to get the best patio furniture for you. The material is going to be a big decision as that is one area where you will need to decide for yourself which one is going to be the best for you. The space that you have is also going to play an important role in the decision-making process as this might make your mind up on exactly how big of a set you can have. This will also be dictated by the number of people you are going to accommodate and the budget that you have. Usually style shouldn’t be at the forefront of your mind when it comes to a product as you should be thinking about its functionality but with a product like this, it’s going to be very important. 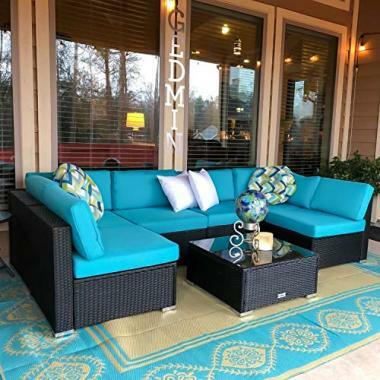 Each product comes with its own materials, designs and colors and this is going to be up to your personal preference and what will suit your personality and patio. Once you have taken all this into account you will then be in a great position to be able to pick the perfect product for you. Hopefully this guide has given you all the information you needed so that you can be confident in the decision. If you are, then all that’s left to do is wait for it to arrive and then relax in your brand new patio.